Like NAD, Rotel has for many years steered a careful course somewhere between the vast multi-nationals (Sony, Yamaha) and the small specialists, as well as managing to maintain a profile associated with distinctive products of good performance and value. The RC-1580 and RB-1582 amps are actually among the more expensive we've seen from the company and it's no surprise to find out that they are the current stereo range-toppers. In terms of basic specification they are well equipped, with the RC1580 preamp offering eight line inputs, plus phono (both flavours), while the RB1582 is a particularly high-powered beast. But does one actually need that much power for domestic audio? Obviously the answer entirely depends on the speakers, the space to fill with sound and the target loudness. A few spare watts never hurt and the high current delivery, which is also on offer, is often handy for controlling awkward speakers, even at lower levels. You'll notice that the preamp thoughtfully includes separate source selection for listening and recording. 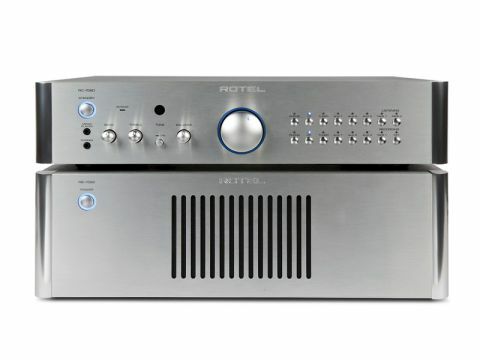 In order to provide this flexibility, Rotel has had to compromise slightly on the signal switching arrangements, which use relays for listening and an electronic switch for recording. The volume control is a motorised mechanical one, and the (switchable) tone and balance controls also use mechanical parts. The power amp features a particularly large mains transformer, with separate secondary windings for each channel, plus huge supply smoothing capacitors grounded via a large copper plate.